Certificate Amount * × $1.00min 5 Enter the value you would like for the gift certificate. Don’t know what to get that special someone? Music, books, videos, unique Cajun souvenirs… Gift certificates are the perfect solution! 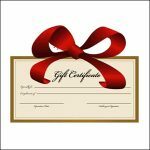 Gift Certificates are sent with a copy of our latest catalog of Louisiana Cajun, Zydeco and Swamp Pop music, gifts, videos and more to the recipient via U.S. postal service, 1st class rate, at no additional charge. Use them all at once or save some for later as they never expire! *Gift Certificates can be for any amount from $5.00 on up. Simply enter whatever amount you would like it to be.